The Ethiopian ambassador to Nigeria, Samia Zekaria, paid an official visit to IITA Headquarters in Ibadan on 12 May to expand and strengthen partnership ties between Ethiopia and IITA, as well as gain a better understanding of the ENABLE Youth Program–a collaborative initiative between IITA and the African Development Bank that seeks to empower youths through agribusiness. IITA staff led by Melaku Gedil, Acting Director General, welcomed Ambassador Zekaria, who was joined by Counsellor II Alemu Gesuma. 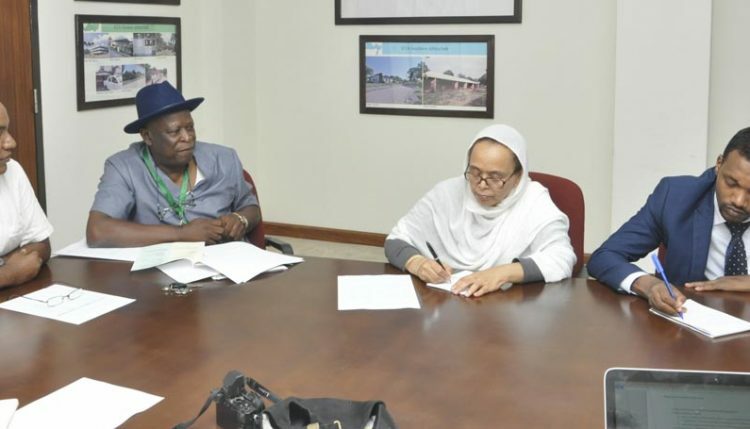 (Left to Right) Melaku Gedil, Alfred Dixon, Samia Zecharia and Alemu Gesuma discuss future collaboration between IITA and Ethiopia. During the briefing, Gedil, an Ethiopian national and head of IITA’s Biosciences Center, highlighted the ongoing collaboration between IITA and Ethiopia (e.g. existing projects, capacity development opportunities involving PhD and Masters students, short-term training involving Ethiopians at IITA), and emphasized IITA’s commitment to capacity development, especially in the areas of bioscience and biotechnology. He further stressed the need to formalize these collaborations for a lasting impact. During the discussion, Alfred Dixon, Head of Partnership Coordination Office, and project leader for Cassava Weed Management Project, emphasized the need to institutionalize partnerships between IITA and Ethiopia. He said a host country agreement would enhance efficient and effective partnership of various value chains for diverse crops so that IITA could contribute to the agricultural development of Ethiopia. He also expanded on the concept of the ENABLE Youth Program. On moving forward with the collaborations, he said “We need to put a road map, an action plan. We look forward to expanding these roles and addressing the food needs in the country and the region”. The Ambassador said that “agriculture is the only way to reduce poverty in Africa”, and indicated that Ethiopia is looking at enhancing collaboration and capacity building areas of its scientists. Their crops of interest include cassava, maize and cowpea. Ethiopia also showed keen interest in participating in the ENABLE Youth Program. The briefing was followed by a tour of the IITA Youth Agripreneurs (IYA) set-up, which is the pioneer model ENABLE Youth seeks to replicate and expand. The ambassador was introduced to the IYA platform by Frederick Schreurs, Chief Executive Officer of IITA’s Business Incubation Platform (BIP). During the tour, she engaged with IITA youth agripreneurs and listened to presentations that highlighted their achievements. She was treated to several products developed and marketed by the agripreneurs. Ambassador Zekaria expressed pleasure over the number of young women meaningfully engaged in agribusiness ventures in IYA. “I see a lot of women and I am very impressed. It is very good to see so many young women engaged in this platform. This is an interesting project to boost agriculture. Africa has a large youth population but a problem with youth unemployment. We have the resources and the personpower. It is a matter of putting the resources together. This is a good project. It makes the youth self-sufficient. We will take your message back home,” she said. In closing, Sylvia Oyinlola, IITA Western Africa Hub Regional Administrator, thanked the ambassador for her visit and expressed hope for further collaboration.